Hot summer days won’t be the same without your flattering off the shoulder gypsy crop top, beautifully made to make you look and feel irresistible. 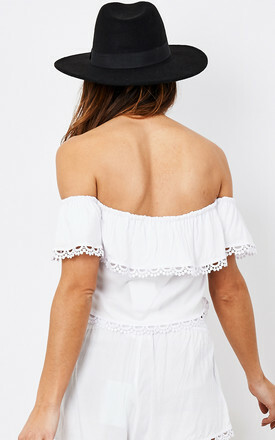 Join in on the festival gypsy vibes with our crisp white elasticated bohemian style top with lace trim. Mix and match with The Eliza shorts to create the ultimate matching summer outfit. Made from 100% rayon this top is super comfy, you’ll never want to take it off!